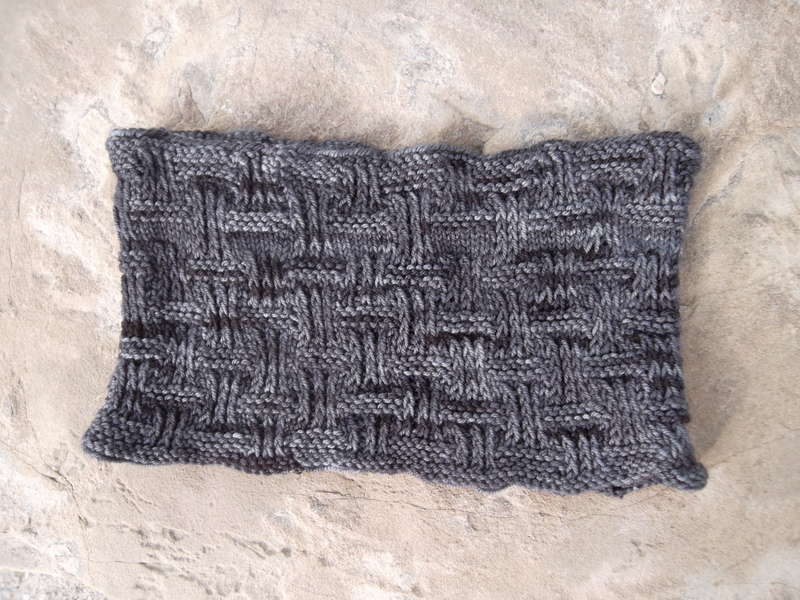 So, there is this cowl pattern that has haunted me for the better part of two years. And it’s not even a complicated one. My darling husband wanted me to make him a Stonehenge Neck Warmer so we purchased a skein of Plymouth Earth Hillside Linen in a nice grey and off I went. After I got a little ways in, it became painfully evident that it looked terrible and I frogged it. According to my notes I tried it a second time with the same yarn and the same result (but I don’t remember – clearly I have repressed this memory). So try number two with a commercial yarn I adore, Filatura Di Crosa Zara Chinè. Again, two cast ons and two froggings. I gave up. Then last December, a colleague of mine stopped by my desk to admire something I was knitting and in a fit of madness, I offered to knit him a cowl – and what pattern did he pick? The very same one. So I told him I would order him some of indigodragonfly’s MCN Sport (one of my very favourite bases to knit with!) and he picked a gorgeous grey mix called “Angst For The Memories”. As I am traditionally a tight knitter, I cast on using the recommended needle size, but again, the cowl was huge, the fabric was gappy and unattractive and needed frogging. The recommended needle was clearly too large for the DK weight yarn. In a last ditch effort, I cast on two needle sizes smaller. Success!! The fabric finally started to look reasonable, and the size looked as though it would fit a regular-sized human. I decided, about a month ago that I was sick of looking at it in the WIP section on my project page so, I finally motored through to finish it. Hubby loves it – so there is a distinct chance I will end up knitting another but at least now I know what size needles to use to try it again, if I were to use another DK weight yarn. I think using worsted yarn in the prescribed needle size would really necessitate a smaller cast on, as this size turned out to be perfect.